Well well well.. It’s time to start looking forward to the upcoming collections! As we step into September, I start smelling the pumpkin spice and cinnamon already. The Summer is not over yet but I am ready for fall/winter!! 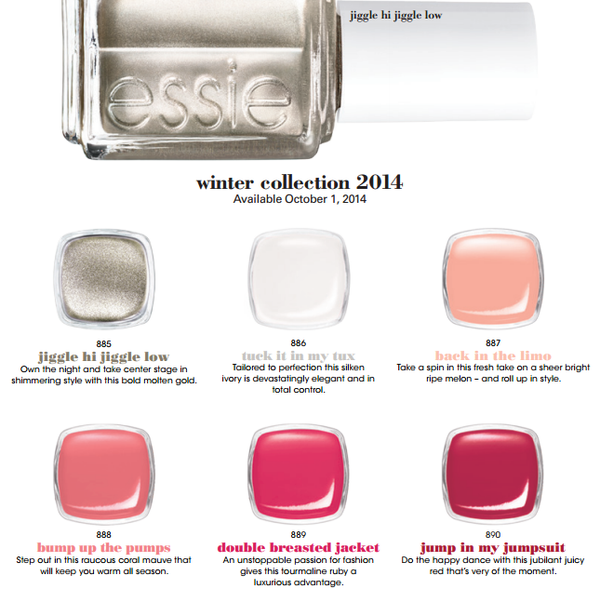 Hitting stores October 2014, is the Essie Winter 2014 Collection, with 6 new shades. Ohhh I love this collection! I can’t wait to see the colors in person! Yes , Essie has been really wonderful with their collections this year .. This sure will be interesting ! Ooh so lovely! These colours are fab! Looking … Looking right now ! I love your choices of polishes !!! I’m outside so using up limited data on phone but I promise to come visit your lovely blog tonight !!!! I will be very happy about that dear, thank you!